Sometimes I get flashbacks from my childhood. You know – like when a whiff of something brings a smell-memory flooding back? Over the past year, I have been working with a group of parents from our school district in a grueling effort to improve the food that is served in our schools every day. And it’s in the middle of meetings with people yelling at each other or when I visit the cafeteria and see boxes and boxes of packaged foods that I hear it. “I think I can, I think I can…” Do you remember the story of the train that chanted that mantra as he worked so hard to climb that hill? That’s how we feel about our struggle to change school food. But I have to say – I count ourselves as the lucky ones. After years of refusing to work with the community, our food service director has changed. Who knows what triggered it – maybe it was Jamie Oliver, news everywhere about unhealthy children, or maybe even the pleas from the first lady. And really, who cares? We ARE working together as a team now – and that’s what counts. Some of our early progress was to get our food service director to agree to stop buying sugar coated cereals. It is our belief that since the children are eating at school, that we need to provide them an educational message. We didn’t want them going home thinking that we endorsed sugar cereals (or the super-sized bowls that they would probably consume if they were eating them at home). 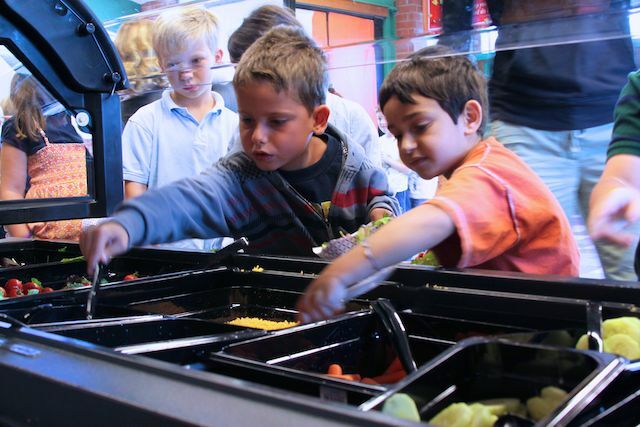 But our most exciting news was that our elementary schools would be getting salad bars! 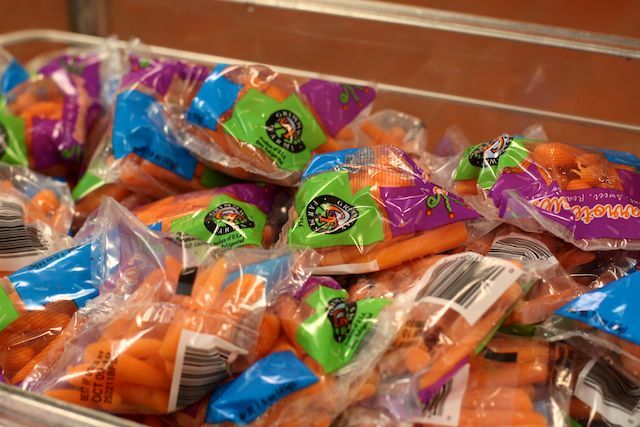 Not only did that mean that our kids would have access to fresh vegetables, but it ultimately also meant that they would be served an entree and everything else would be served from the salad bar. You know what that means? We could get rid of more packaging! Some of the good news, despite our challenges, was that we could stop buying everything in packages and could start purchasing in bulk. Carrots, for example, could now be served out of one of the bins in the salad bar. And we no longer needed those annoying little fork packets! All of these small changes end up saving the school district money, in the long run. Instead of buying items that go straight to the garbage AND paying the local waste management company to haul it all away, more of what we purchase gets used and there is less garbage. Our struggle has been mighty, but our students are enjoying the benefits. We still have a long way to go and have a big wish list that includes the removal of trans fats, artificial colors and high fructose corn syrup from the items that we serve our students. 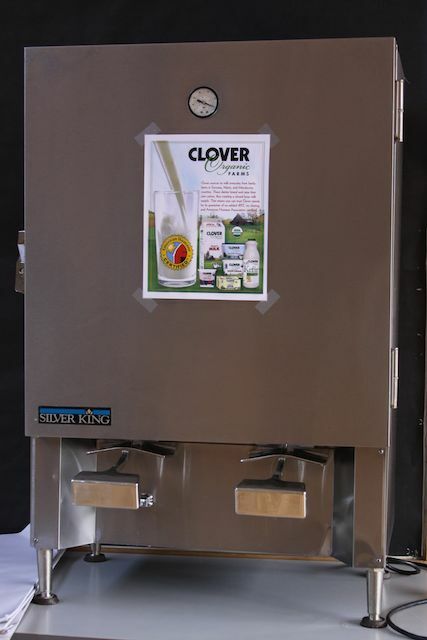 And eventually, we’d even love to serve milk in bulk. I sure hope that bin of unwrapped forks was a "before" image! 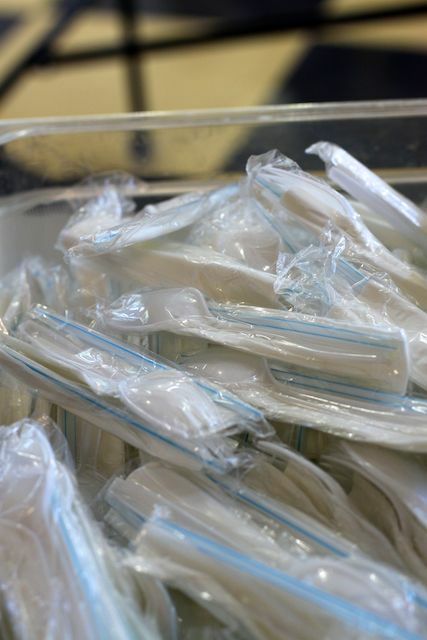 If you are using unwrapped utensils, they should be arranged handle up in a container so that the kids can select a single utensil without touching a lot of other ones. Where's your Health Department on this? michelle, nice to see you here, love that your efforts in CA are getting much deserved exposure. i would love to hear more from you in a later post (a GP on FwKA maybe?) about how you drummed up volunteer support district wide. i'm at that point now in SBISD. we have a school food reform sub-committee at the district school health advisory council (who makes recommendations to the board), but i need to figure out how to get parents and community members involved. right now, it's our school food service group (CNS) and a couple parents from my elem. school on the sub-committee. CNS and the board will take us more seriously if we are a larger, district wide group with parent, staff AND community members. not to mention, we can accomplish things quicker with more hands on deck. we're doing a second breakfast pilot next week, offering only cheerios. if participation doesn't fall off, and plate waste surveys aren't horrendous CNS may nix the "lower" sugar cereals all together. fingers and toes crossed. Looks like you are already off to a good start – it's crazy how many hoops you had to jump through. When you said what brings back cafeteria memories? I was thinking ice cream sandwich…and sure enough, there it was (ours was just a different package). Thanks for your work. 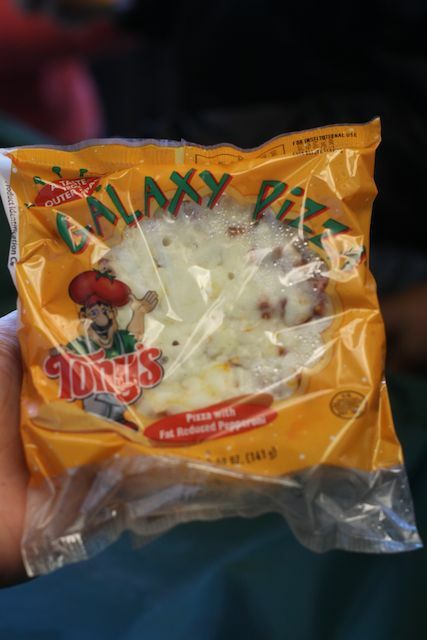 I have never actually seen the Galaxy Pizza before, now I wish I could UN-see it. It's on my daughter's hot lunch menu once or twice a month and it's about the only thing she ever wants to buy at school. So far I have always allowed her to buy it. I probably will still let her. A mom needs a break from lunch packing once in awhile, but that sure is a sad excuse for pizza. Please consider adding MSG to the list of ingredients to remove from the school lunch menu. @Belinda – enlarge that picture to read the smaller print: it's actually a PB&J! Scary! The environmentalist in me thinks that serving bulk milk would be awesome. The nanny and teacher in me are both envisioning kindergarteners trying to walk across the cafeteria with an open glass of milk on their tray…in college getting those glasses from the serving area to your table could be tricky. I can imagine kids serving themselves salad. Drinks? That sounds like a nightmare. Monica – I laughed at your comment. I thought the same thing – how hard it would be for kids to not spill the milk in a cup as they walked from the dispenser. Thanks Jen – yes, MSG is on our "no list"
Belinda – it's nuts, but that sandwich I showed here is really a peanut butter and jelly sandwich on graham crackers! 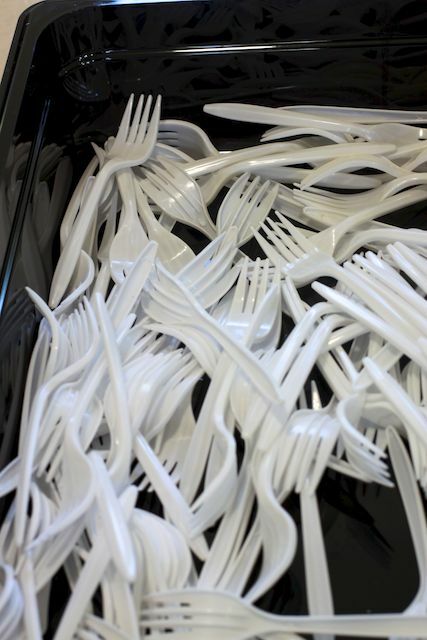 No, the forks are the after picture – kids simply grab the handle. It's easy. Everything old is new again. *smile* I remember bulk milk. Anyway, questions about the salad bars if I may? Trying to figure out what I'd need to do to make such a change. Just wondering how many volunteers/employees are needed, how much time it takes for kids to self-serve? I guess that would include wondering what grade levels/ages and how many students? I'm faced with the all too common "15 minutes to get your lunch and eat it" situation…and a pretty large number of students. Are there cooked vegetables served or is the menu basically a main dish and self-serve cold fruit/vegetable bar? Oh, and the forks? Our health departement would balk at the loose forks…but there is variation in what is enforced from place to place, that's for sure! Michelle – It's so awesome that you're sharing your experience so that others can learn and be inspired. 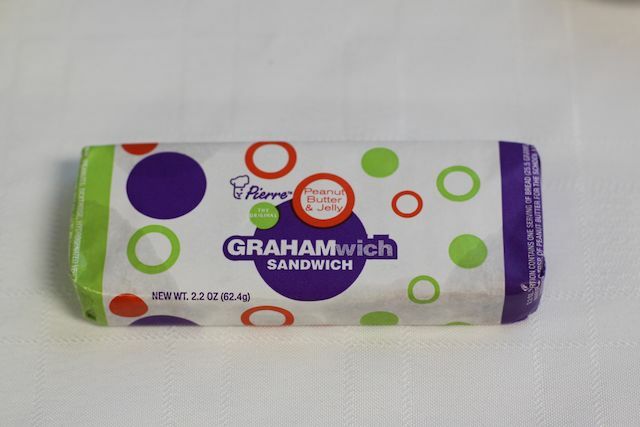 I have to know: what is a grahamwich? Is that an ice cream bar or some treat? "It is our belief that since the children are eating at school, that we need to provide them an educational message." Can you believe that our school district bought salad bars for all the schools last year and then decided this year to get rid of them because they are not accountible enough for them to get their reimbursement? I've talked myself blue in the face and even talked to a neighboring district that uses salad bars and assured them that they can have a reimbursible meal with a salad bar but it has fallen on deaf ears. Help! We are in Duarte, CA – a suburb of Los Angeles. Please send Jamie Oliver, fast! 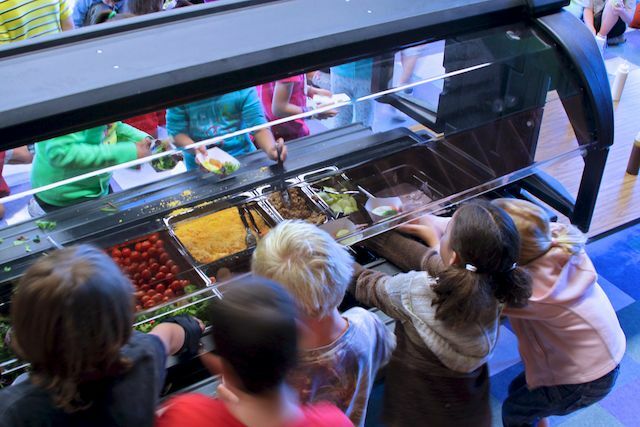 purple echo – our district has the same position on salad bars, they won't move forward because it's hard to determine if a meal is reimbursable. frustrating when districts use excuses like this to keep serving crap to kids. i appreciate that there are obstacles like tiny budget, acceptability, regulations, and reimbursements etc. but we can't keep serving junk to kids just because it's hard to get over the obstacles. That proves a (sick and wrong) point about just how sad the food situation is in America–the LOW SUGAR cereal is Cinnamon Toast Crunch… you know… the one that has visible sugar granules on every piece. I think you're right to try the Cheerios only experiment. I love cheerios. They are one of my favorite kinds of cereal and I don't know if there's a kid out there who hates them. BUT. I love cinnamon toast crunch. To the point that, even liking cheerios, I would likely choose cinnamon toast crunch each and every time it was put before me. Even as an adult who knows better, and who also loves cheerios. It's like dessert. I don't mind having something like fruit, yogurt, and honey for dessert. It's good for me. It tastes good. But if the alternative option is a brownie, guess which one I'd reach for every time? I guess the moral of this long reply in response to another reply is that I really don't think the kids are going to start an open rebellion if Cheerios are the only thing on the menu. But when you present kids with one type of cereal that is visibly coated in sugar and one type that is not, it's not rocket science to predict that they'll take the sugared cereal, even if they LIKE the healthier option. I'd love to hear an update on whether the cheerios-or-starve experiment works. Maybe Mrs. Q will let you do a guest blog so you can tell us whether the kids rioted when their sugar crappies were taken away… Although I seriously doubt that they'll freak. Purple Echo – You might be able to solve it on your own! What is the district down the road doing that is different than your district? Can you make those changes in your district? As far as regulations (accountability), well, they are just that…regulations. To change those, we need to start higher than the cafeteria – federal and perhaps state government level.